Exiles finished their commitments in this year’s Winter League with a win against Valletta United yesterday afternoon, to end fifth in the final classification. The match saw the debut of Michele Stellini with the first team after a few weeks ago, he penned another contract with the Club. Together Timmy Sullivan (1 goal), Aurelien Cousin (2 goals) and Benji Lanzon (1 goal), his name featured in the scorers’ list with a brace. 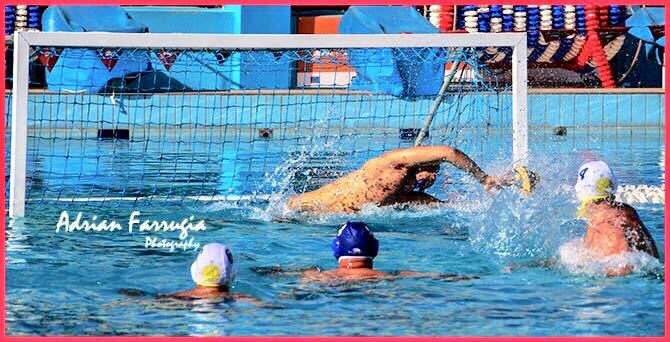 photo by Adrian Farrugia shows Exiles’ keeper Matthew Castillo saving a Citizens’ penalty in the final quarter with the score 4-3 in favour of Exiles 3 minutes 40 seconds to the final horn.